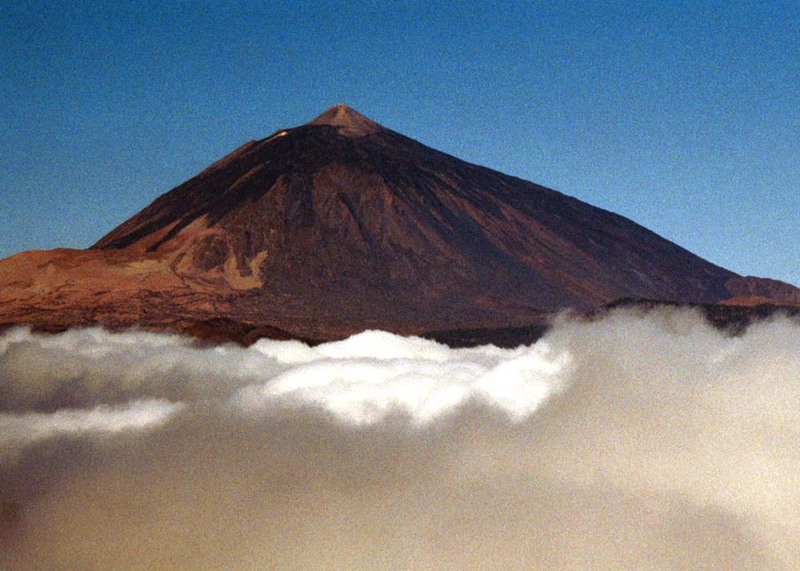 The volcano of Mount Teide rising above the clouds of Tenerife. Download full text (2,727 kb in pdf). The 2004 Sumatran tsunami was a global catastrophe. Even countries that were not directly affected by the tsunami counted the casualties amongst their nationals who were visiting the affected regions. This global catastrophe emphasised the need for effective disaster management and planning and it also emphasised the necessity to incorporate the tourist within these plans and procedures. This project was therefore inspired by the 2004 tsunami. It investigates the current role tourists play in disaster management and to produce a set of factors which can be used as a guide to incorporate this vulnerable sector of society into emergency plans with particular reference to volcanic regions. An extensive literature review concluded that there are three stages to emergency planning: proactive; real time; and post activity. Within these stages 14 main factors were identified by the researcher as vital in incorporating tourists into emergency planning. These factors were then assessed in the field. The field work for this project was carried out in Tenerife, one of seven volcanic islands of the Canary Islands situated in the Atlantic ocean of the coast off North Africa. This island was chosen as a field work site due to its popularity as a tourist destination with an annual visitor number of over 5 million. The International Association of Volcanology and Chemistry of the Earth’s Interior (IAVCEI) categorised the islands summit volcano, Teide, as one of the highest risk in the world, due to it active eruptive history and the high population density in close proximity. The field work consisted of interviews and questionnaires designed for the main stakeholders. Following their completion the results found that the proactive management factors produced during the literature review were valid and robust. Certain issues became apparent during the investigation. The first being the issue of responsibility and second a fear of discouraging tourists from a destination. The project concluded that a set a 14 simple factors could assist the incorporation of tourist into disaster plans. In addition this project found that Tenerife’s current emergency management and plans are highly unsatisfactory. In order to avoid a major catastrophe these plans must be developed, practised and put into use. 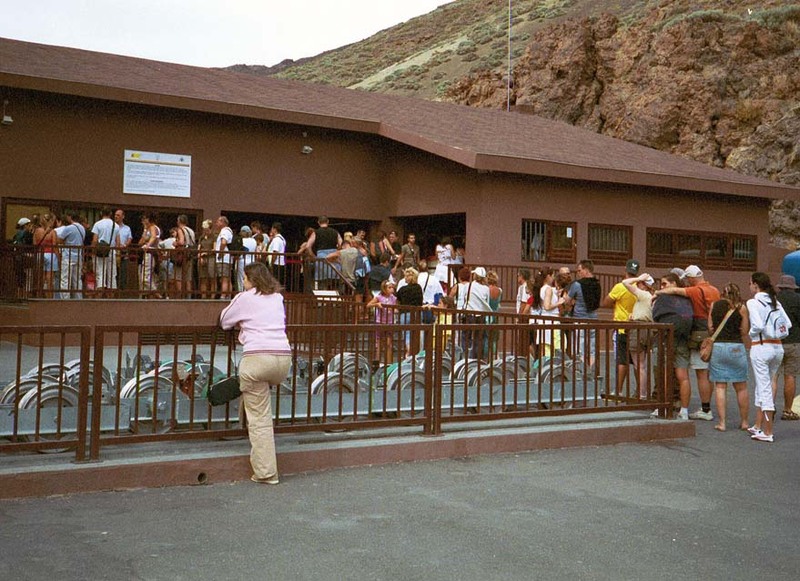 Tourists queuing for the cable car up to Teide's summit. At a crossroads of continents and cultures, Tenerife has historically been exposed to the ups and downs inflicted by the changing times, not always easy to absorb due to its islandness, an endemic "condition" whose effects can be generally described with the concept of "island vulnerability". Once upon a time the peak of the lost Atlantis, its legacy is a vast natural richness consisting of endemic species intertwined into unique ecosystems across its numerous climatic strata, from sea level up to its glorious 3,716 metres of altitude. This fragile natural treasure, however, has been constantly threatened by several factors, such as infrastructure development and subsequent habitat fragmentation, despite the designation of numerous parts of the island as protected areas and the national park of "Las CaÃ±adas". A not-so-well managed service-oriented economy has put pressures on Tenerife's small territory, in the form of extended dwelling surfaces, commercial and leisure centres (including golf courses, which contribute to depletion of existing water reservoirs), and a complex road network which has eaten up the traditional rural land, where a rich variety of fruits, vegetables and flowers from all over the world thrives, thanks to the more than hundred microclimates existing on the island. This "vega" of typical products forms the basis of the fantastic "Tenerifean" cuisine, one prominent ingredient of the colouristic folklore of the island, which also expresses the character and qualities of its people through music, dance, and stories. Tenerife's culture has long been influenced and enriched by Latin America as a result of trading products, people, language, and ways of life. The first inhabitants of the island, the Guanches, also relegated to us a particular world composed of archaeological treasures, including mummified bodies, and an almost-lost language which still resonates in our personal names, place names, and legends. All this natural and cultural richness, though, has in many instances become secondary to the tastes of a low-quality "beach and sun tourism", which has led to crowding of the island and degradation of the coastal zone. Tenerife's rich natural and socio-cultural elements are thus vulnerable to foreign influences, but above all, are susceptible to the attitude of us locals, when we don't fairly value our countless resources, which should be protected and respected above all. Promoting them, as well as strict enforcement of regulations that avoid their degradation, should be the basis for sustainable development of the island. Promoting rural tourism focused on the environment--such as trekking, climbing, astronomy, and sea-sports--as well as on local gastronomy, history, and culture, is an alternative to the current status. This requires effective and proper marketing, as well as targeting those social groups who hold adequate values and who are capable of respectfully enjoying what is offered. Neighbouring islands, such as La Palma and El Hierro, are successfully leading the way, attracting mainly medium-to-upper class, young, German tourists. One other aspect of Tenerife's vulnerability is its well-known volcanic nature. Until recently, the quietness of natural forces acting on the island have stopped people from perceiving Teide as an imminent threat. In contrast, we have harmoniously lived in its presence, which is one source of our pride. Over the past few months, however, several small earthquakes have made people aware and fearful of the possible consequences of a significant volcanic event. Close monitoring of volcanic and seismic activity and implementation of effective evacuation plans would be the most adequate approach to handle such an event. From my perspective and my people's, Tenerife is a jewel in the middle of the ocean, a vulnerable jewel that deserves our care, respect, and attention. Part of the aqueduct system supplying parts of Tenerife with fresh water. Mount Teide on Tenerife seems to have erupted about once every one hundred years for the period for which we have reliable records. The last one was in 1909. Thus, we might be due for another one soon. Typical signs of impending volcanic activity are small earthquakes, possibly for up to eighteen months before the eruption, and earthquakes occurred on Tenerife in spring 2004. What is being done, and what should be done, about the potential threat from the volcano? Should we be doing anything? The latter is, perhaps, the most fundamental question. What should we make of the fact that the greatest threat to people in the Canaries seems not to be their potentially volatile natural surroundings, but human-induced hazards? Do we over-react to environmental events when we are quite capable of causing equally, if not more, devastating events? Should we be diverting resources to stopping environmental events, which the world has survived with since it began, before we can fully control our own inventions and constructions--which we, therefore, presumably understand, or should understand, better than the mysterious workings of the earth? I think the answer must be 'yes'. As long as the community wishes it, we should work towards protecting what the community affected deems to be important from both environmental and human-induced events. We should devote research and application resources to both. If the community wants particular things to be protected, why make car travel perfectly safe if a volcanic eruption will destroy all we care about? But are we doing enough to deal with environmental events? Cars and planes (and basically any potentially dangerous human product) are frequently analysed and attempts are made to make them safer. 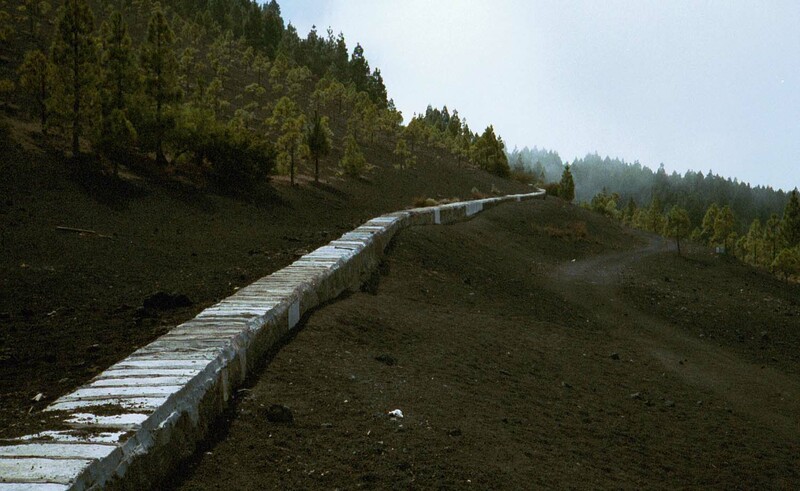 Do we put similar effort into environmental events, in this instance Tenerife's volcano? I would suggest possibly not, at least not on a widespread level. With the natural environment, many people seem to have an almost irrational fear of the unknown, of something that we cannot control. Efforts have been concentrated not so much on actually providing measures to mitigate the effects of the disasters so much as on understanding why they occur. It would be like analysing a car crash and establishing that it occurred because the road was slippery, and then setting out to monitor the slipperiness of the road, rather than doing anything proactive to stop people being as badly injured next time, such as driving appropriately for the road and weather conditions. Understanding the event is important, but alongside that must go a strong emphasis on protecting the community. We will never be able to stop environmental events. We can be prepared for them and have measures in place to prevent and mitigate impacts. This sentence introduces a second aspect of research necessary for reducing the potential impact of disasters: the social, psychological and historical contexts. Analyses of personal and community reactions to the volcano and its potential effects would help to determine which sites and objects should be highest priority. 1. There is no weekly schedule for the eruptions. Some Canary Islands have not been hit for centuries and, when they are, there tend not to be many human casualties as there is usually enough warning for people to retreat to a safe distance. Such descriptions help to bring the volcano to life far more than dry scientific analysis ever can. This kind of information is needed to assess the true impact of a volcano on its community. Given simple figures of the havoc a volcano may wreak on its surroundings, it might be difficult to understand why people might choose to live in the shadow of a volcano. It could be harder to understand why people might choose to rebuild their homes on a site where buildings and the potential for wealth were destroyed by the last volcanic eruption. Yet the inhabitants of Garachico did rebuild in the same place after the 1706 eruption. Those of us living a safe distance away from a volcano may struggle to realise the attraction of such a place. Attempting to understand is essential if we are to deal sensitively with the place and people affected by a potential or actual disaster. At the very least, we should accept that factors exist which we do not fully comprehend. We should accept the need to consult the community about their feelings and desires rather than assuming they have the same priorities as we do. The reason for trying to monitor potential disasters and to develop ways of averting impacts is, presumably, to benefit the local and wider communities. How are we benefiting these communities if we don't listen to them, don't understand their heritage, and don't ask what is important to them? For the people of Tenerife, it seems that the volcano is simply a part of their lives in the same way that cars and aeroplanes are part of many other people's lives. The threat from the volcano might even be no higher than from human contraptions. People choose to, and often enjoy, driving cars and travelling by aeroplane despite the risks. Might the people of Tenerife enjoy living on their island and having their relationship with the volcano? Might their respect for it inhibit a desire to see it tamed (especially when efforts to tame it are likely to fail)? We often assume that the first priority is towards keeping humans, and their constructions, unharmed, but is this necessarily the case? Might a desire exist to let nature take its course? My questions are not aimed at encouraging a purely passive or fatalistic attitude without any attempt being made to stop a volcanic disaster. That the people of Tenerife want at least some things to be protected is evidenced by their removal in 1704 of the statue of the Island's patroness from harm's way. Rather, my questions are aimed at encouraging people to question their natural assumptions about what is for the best. We might assume that it is for the best that schools and hospitals be protected, but the people of Tenerife may disagree. They may feel that for such utilitarian sites, nature should be allowed to take its course. There might, however, be a different attitude towards objects of historical and/or psychological importance to the community. Those sites may be worthy of protection. I should stress that I have not interviewed people from Tenerife. These views are based on ideas drawn from the extracts quoted above. It may be that, on analysing the historical, social, and psychological contexts, the solutions desired would be the ones considered prior to local consultation. But they might not be. Research and consultation should be carried out before spending vast amounts of money on something the community could quite happily have lived without. 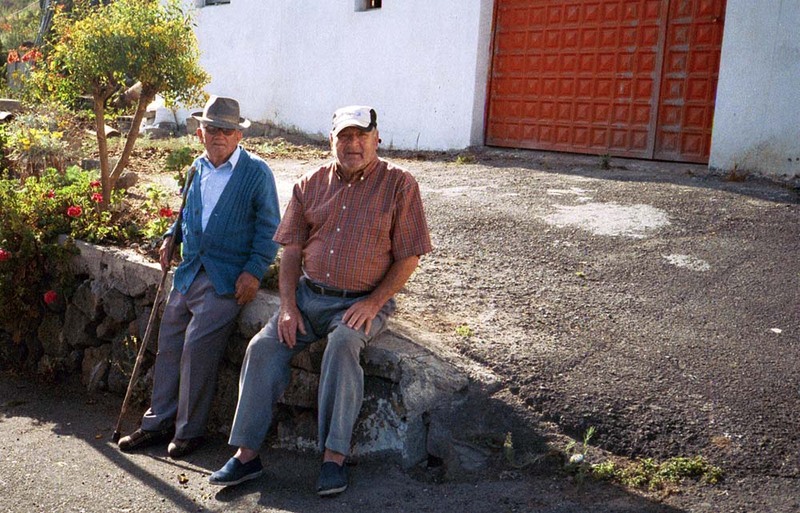 Residents of the municipio of Icod de los Vinos, Tenerife.